The theoretical framework used to study these questions and guide our data collection builds from the program theories in the six participating countries (see Ehren et al, submitted). These program theories include a description of the mechanisms through which each Inspectorate aims to affect school improvement. 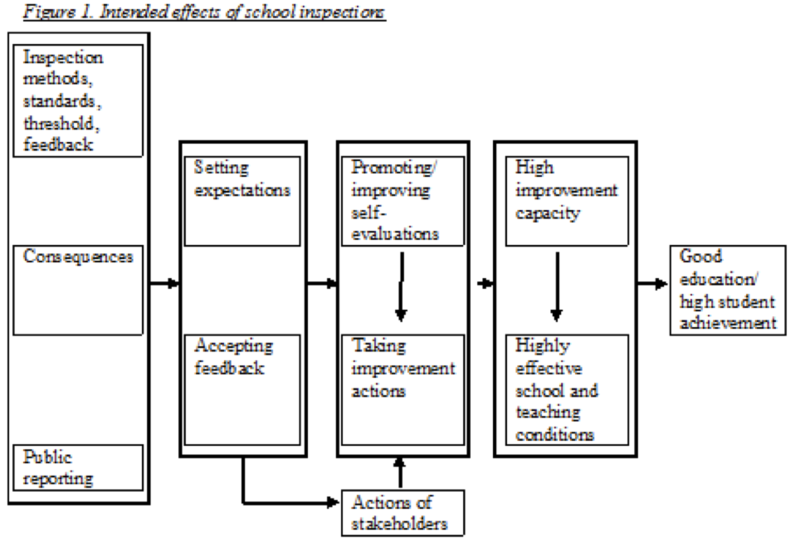 The assumptions describe the causal mechanisms of how school inspections are supposed to lead to the improvement of schools, linking school inspections to their intended outcomes of improved teaching and learning in each country. The assumptions and program theories in each country were reconstructed using a documentary analysis and interviews with inspection officials. From these six program theories we derived the intermediate processes and mechanisms and intended outcomes that are common to all six countries to be included in our theoretical framework. The first part of the framework includes a number of variables describing how school inspections, their criteria and procedures in general, and the feedback given during inspection visits are expected to enable schools and their stakeholders to align their views/beliefs and expectations of good education and good schools to the standards in the inspection framework, particularly with respect to those standards the school failed to meet during the latest inspection visit. Schools are expected to act on these views and expectations and use the inspection feedback when conducting self-evaluations and when taking improvement actions. Stakeholders should use the inspection standards, or rather the inspection assessment of the school’s functioning against these standards (as publicly reported), to take actions that will motivate the school to adapt their expectations and to improve. Self-evaluations by schools are expected to build their capacity to improve that will lead to more effective teaching and learning conditions. Likewise, improvement actions will (when successfully implemented) lead to more effective schools and teaching conditions. These conditions are expected to result in high student achievement. Figure 1 summarizes these mechanisms and presents the conceptual framework of our study. A more detailed description of the variables and mechanisms is presented below the figure. The intended effects across all European Inspectorates in our study are described under a common denominator of ‘aiming for good education’. The specific outline of what constitutes ‘good education’ however varies from country to country, ranging from equity-related perspectives of providing equal opportunities to students, to indicators on the quality of teaching and learning inspired by school effectiveness research to administrative/legislative input-related requirements. The descriptions of ‘good education’ also vary from a system-level perspective (focusing on for example on the quality of the whole education system), to describing good education in individual schools. Inspection policy documents in our study routinely refer to capacity building and improvement actions as important objectives of the inspection process. They function as what we describe as intermediate effects of school inspections in that high improvement capacity and improvement actions schools take to address their weaknesses are expected to lead to the eventual intended effect of good education as described in the previous section. Most inspection documents do not provide a detailed description of what capacity-building entails. Geijsel et al (2009) however describe capacity-building as the capacity of schools to enhance the professional learning of teachers and to transform large-scale reform into accountable student-oriented teaching practices. A school is thought to be capable of change if it is competent to implement innovations initiated either by the government (or the Inspectorate of Education) or by the school itself (as a result of the outcomes of self-evaluation), and if necessary, to match both types of innovations. In this context, Geijsel et al. (1999) stress the importance of the school as a learning organization which consciously attempts to expand its learning capacity to optimize its effectiveness (Geijsel et al., 1999). Participation of teachers in decision-making, cooperation between teachers, and transformational leadership are considered to be important conditions of learning organizations. The first causal mechanism relies on a process of setting expectations defining good education for schools and their stakeholders. The standards and procedures of the inspection are assumed to infuse schools and their stakeholders with notions and practices of what is considered ‘good education’ in each country. These notions will stimulate schools to embark on processes of adaptation to these norms and of institutionalizing them into their work structures and culture. The idea is that schools will attend to the information included in inspection standards and procedures; they will reflect on it, process it and adapt their goals and their practical ways of working in such a way that they come closer to the normative image of schools communicated by the inspection. Eventually, these notions should drive the school’s own planning, self-evaluations and daily practices. The second causal mechanism to promote intended effects is through the feedback that is provided to schools during inspection visits and/or in inspection reports (and the consequences for not following up on the feedback). Schools are assumed to use the feedback to improve, and stakeholders are expected to take note of the feedback and hold schools accountable for their use of the feedback for improvement. The third mechanism to promote intended effects of school inspections in our study is the provision of information on the inspection process to a broad range of stakeholders. While Inspectorates choose to interpret differently who is to be considered a relevant stakeholder, each of the systems sees stakeholder involvement as being essential for improvement. Stakeholders, such as parents and school boards, are expected to facilitate school improvement through actions of ‘voice’, ‘choice’ and ‘exit’. These stakeholders are seen as key change agents in a post inspection school environment. In this understanding of stakeholder involvement, the informed parent is expected to hold the school to account by using the feedback provided by the inspection to demand improvement in specific areas. In the event of this improvement not taking place, ‘market mechanisms’ will induce parents to move their children to different schools which, in turn, will stimulate schools to improve their performance (Hoxby, 2003). Geijsel, P., Sleegers, P.J.C., Stoel, R.D. and Kruger, M.L. (2009). The Effect of Teacher Psychological and School Organizational and Leadership Factors on Teachers’ Professional Learning in Dutch Schools. The Elementary School Journal, 109(4), 1-22. Hoxby, C. (Ed.). (2003). The Economics of School Choice. Chicago: University of Chicago Press.